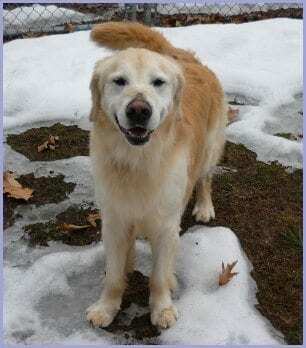 Cody #5184 - Yankee Golden Retriever Rescue, Inc.
Cody’s family could no longer keep him due to allergies and other health concerns within the household. Cody was a very exuberant 7 year old. He needed a lot of exercise and attention, and this wasn’t possible with the current circumstances. His owners made the difficult decision to let Cody go to a new home that would be able to give him the care he needed. Cody was brought directly to one of the animal hospitals we work with and given a complete examination. Our vet discovered that Cody had a heart murmur and recommended he see a specialist before undergoing anesthesia in order to be neutered. Cody had an appointment with a cardiologist and an echocardiogram. He likely had a mild form of a genetic heart condition, but the specialist cleared Cody for surgery. He did fine and was soon recuperating back at Riverview. Cody was an incredibly sweet boy. He was often so happy and enthusiastic that he would forget his own size. He had some puppyish habits that needed some work, as well. Cody would check out countertops for food (in fact, he would jump right onto the table to get something he wanted!). He also loved attention and would jump on people to show his affection. He loved toys, but he could easily tear apart stuffed animals. Cody needed a home where he would get the structure and exercise he needed. 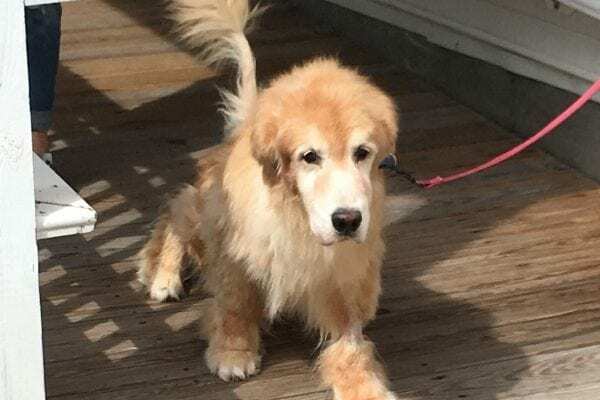 Luckily for Cody, a wonderful family of Golden Retriever lovers was looking for a new family member and was open to the needs of a Rescue dog. They knew an adopted dog would require patience and consistency. They loved Cody’s affectionate personality and good nature and had a sense of humor when he jumped on the desk with all four feet to retrieve a stuffed toy! Cody was soon on his way to his new home. His new family says that Cody is every bit as loving and playful as they expected. They are working on his manners and Cody is learning what behaviors earn him attention. He goes for walks and loves to play in his safely fenced yard. Inside, Cody is like a shadow and follows his owners from room to room. Cody’s adopters love their new addition, and Cody loves being a true member of a family once again! Cody thanks you for your support. We take the time to get to know each of our dogs so that we can match them to the right home for their individual personality and needs. Our ability to spend this time getting to know each dog, as well as our ability to follow up with any medical needs or concerns they have, is only possible with your continued support. Cody and all the Rescue dogs thank you and send big wags and kisses your way!